I am Assistant Professor at Princeton University, in the Mechanical and Aerospace Engineering Department and the Princeton Environmental Institute. We work on fundamental fluid dynamics with an emphasis on non-linear and multi-scale systems. I am focusing on fundamental physics problems, motivated by their importance in environmental and industrial applications, as diverse as the statistics of waves in the ocean, floating ice sheets, gas transfer by surface breaking waves in the ocean, spray generation and dynamics in the atmosphere, as well as oil spill mitigation strategies. We design and develop complementary laboratory and numerical experiments to propose simple physical models describing the processes at play. Currently, we focus on breaking waves, bubble dynamics in turbulence and gas transfer, as well as bubble bursting and spray generation. February 2019: We got awarded the NSF CAREER award, to work on bubble fragmentation by turbulence! See the story here. 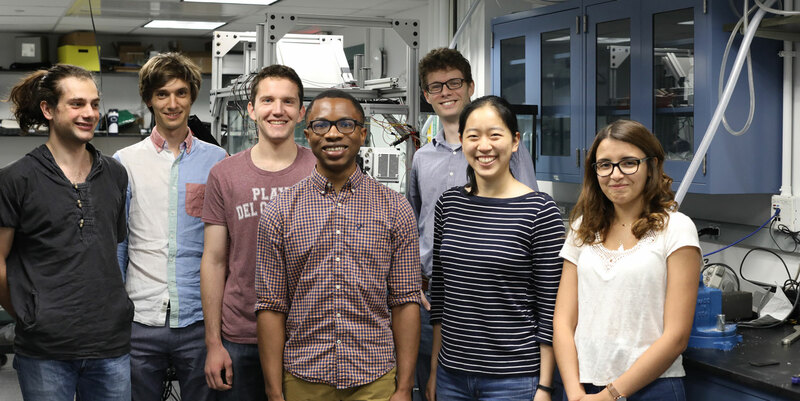 February 2019: Alienor Riviere and Alexis Berny join the group as visiting students. Alienor is a MSc student at ENS Paris and will be staying 5 months while Alexis Berny is a PhD student at Institut d’Alembert and will be staying 4 months. December 2018: Baptiste Neel joins the group as Postdoctoral researcher. Welcome Baptiste! November 2018: The group presented at APS-DFD in Atlanta, with talks by Dan Ruth, Emre Turkoz, Yao Lai, Wouter Mostert and Luc Deike. September 2018: Alumni of the group Stephane Perrard is appointed Junior Research Chair at Ecole Normale Superieure in Paris. Congrats Stephane! September 2018: Dan Shaw joins the group as PhD student. Welcome Dan! August 2018: Jiarong Wu joins the team as PhD student. Welcome Jiarong! June 2018: Yao defended her PhD thesis. Congrats Yao! March 2018: our new paper on bubble bursting is featured on Princeton’s webpage: The paper is published in Physical Review Fluids and available here. December 2017: Wouter Mostert joins the team as Postdoctoral researcher. Welcome Wouter! August 2017: Dan Ruth joins the team as PhD student. Welcome Dan! Department of Mechanical and Aerospace Engineering. December 2017: Wouter Mostert joins the group as Postdoctoral researcher. Welcome Wouter! August 2017: Dan Ruth joins the group as PhD student. Welcome Dan!